Around the wider world of golf: Mi Jung Hur won the Yokohama Tire LPGA Classic; Jiyai Shin won the Munsingwear Ladies Tokai Classic on the JLGPA (the Constructivist has details); Connie Chen won the Tenerife Open de Espana Femenino on the LET; Joost Luiten won the ISPS Handa Wales Open on the ET; Derek Fathauer won the Web.com Tour Championship; and Paul Goydos won the Pacific Links Hawaii Championship on the Champions Tour. Whenever the PGA Tour doesn't play, I have the option of doing a Limerick Summary for one of the other events going on. (Since it's my blog I suppose I have that option every week, but you know how habits can be.) And this week I had a lot of possibilities. Did you know that this week's Wales Open was the final time it will be played on the ET? They had a real shootout going down to the wire, with 8 or 9 guys within a shot or two of the lead most of the final round. Stacy Lewis started the day 4 shots behind M.J. Hur at the LPGA event, shot -6... and didn't gain a single shot. 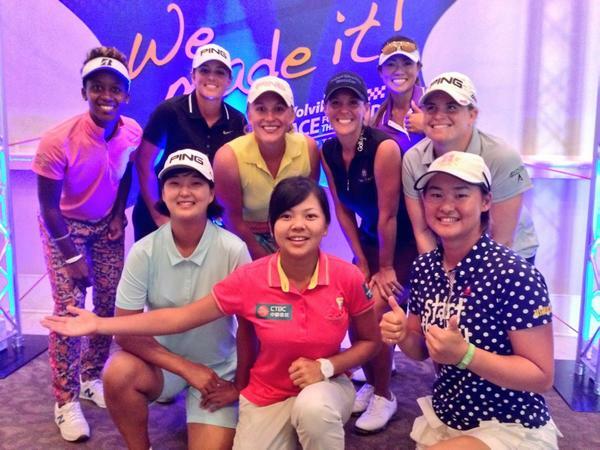 Hur not only got her first LPGA win in 5 years, but set a new tournament record doing it. And of course, we had all the drama at the Web.com Tour Championship. In case you wonder, 3 players got full exemptions to the Big Tour -- Derek Fathauer and Adam Hadwin got the ones with the PLAYERS invite, and Carlos Ortiz had already gotten the field promotion for winning 3 times last season. If you'd like to check out some of the things that went on after the round, you can check out Twitter's #VolvikRace page here. (That's where the photo's from, btw.) Since Gary Williams from Morning Drive was there, I assume Morning Drive plans to do some after-the-fact coverage today. Means she’s off to Finals, not Ragnarok! Good luck to all the Volvik Race to the Card winners... and to Marita and her friends as they prepare for Q-School!